My name is John Stillwell and I am a maker of Native American style flutes. The Native American style flute is also called the Love flute, Indian flute or American Indian flute. Please relax and take a little time to look around my website. It is filled with useful information. Here you will also find a selection of Native American Style Flutes for sale. They are available for immediate delivery. Ancient Territories is a place 'where spirit takes form’. By spirit I mean that power which the Native American peoples called the Great Spirit. It is that power that I strive to keep in my awareness and express in my craft as I make Native American style flutes for you. Every item that I make - whether a flute, a flute bag, a flute stand, a fetish or totem - is made with you, the Love flute player, in mind. I have been a craftsman throughout my life. As I work at making Native American style flutes, my craftsmanship continues to evolve and improve. My flute making is a process that involves personal dedication, careful experimentation and deep respect for the source of my inspiration. Ancient Territories Love flutes are hand crafted musical instruments. I work diligently so that the craftsmanship, sound quality and appearance of my Love flutes inspires your playing. You are the reason that I am here. The Native American style flute that I make for you is something that you will enjoy and treasure. You have my unconditional guarantee. If for any reason you are not completely satisfied with your Ancient Territories flute you may return it to me with no questions asked. My most important reward comes from knowing that with this quality instrument you will be able to express your inner music. 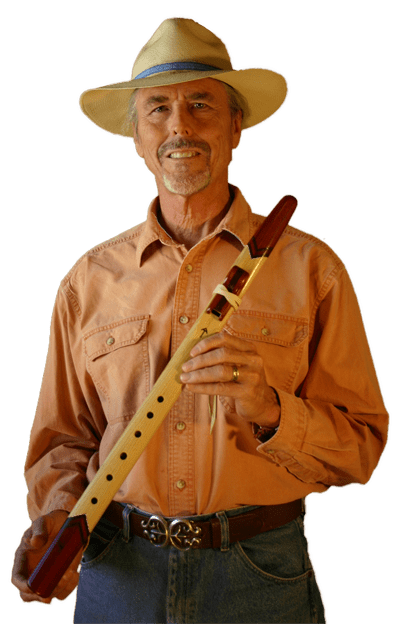 If you are not yet a player of the Native American style flute, rest assured that this simple instrument will connect you with musical experiences that will enrich your life and the lives of those around you. It is not difficult to learn how to play the Love flute. Just relax and let the flute teach you. The Love flute is an instrument on which you can make beautiful music even if you, like me, do not have any musical background. There is music inside you. This inner music will come to life through a finely crafted Native American style flute. For more information about my life as a flutemaker check out my blog.